If you've been face painting for even a short amount of time, chances are you've been swallowed up by the crowd at at least one event. You've literally felt the breath of onlookers on your neck, had your table bumped countless times, and have been asked "where's the line?" by endless parents. If you're smart, you've used this as a learning opportunity to improve things for next time. Maybe you've vowed not to do large gigs without bringing along additional painters. Maybe you've decided that big crowds just aren't your thing, and you don't even bid on these types of gigs. Or perhaps you're still contemplating how to control the crowds and make it a better experience next time. If so, this blog is for you...today I'm going to share some of the new tools that I have in my arsenal for controlling crowds! 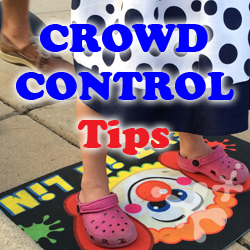 Crowd control is all about providing order, and in turn, comfort for you and less confusion for the party guests. Standing in a "blob" of people and trying to keep track of who's next is just as frustrating for parents as being engulfed by said blob is for you. Parents are having a hard enough time keeping track of their rambunctious kiddos, so if you can put out some visual cues that are as obvious to the kids as they are to the parents, it's a win for everyone! Here are some ways to mold that blob into a line, and even give yourself a little breathing room! "Where is the line?" I've been asked this question too many times at this event, so I bought this great arrow sign online to use this year. Yes, it was $63 bucks. Yes, it looked ENORMOUS in my kitchen. But when I put it outside it was really about the right size, it worked as a connection point for my chain, and finally...finally...not ONCE did anyone ask "where is the line?" Worth every penny in my opinion! This sign is a magnetic white board, so you can write whatever you want on it. I made a laminated sign with magnets on the back so I could pull it down and put up a "closed" sign at the end. The arrow is adjustable so you can angle it as you please. The post breaks down into two pieces, and the base can be weighted down with sand or water. I had to go add some water to it as it initially fell over a couple times. But with a little water, it held up great the rest of the night. If you don't tell the line where to stop, it will stop practically in your lap. I came across this fantastic idea in a Facebook group. I actually designed my own mat on the computer (I have a design background). I gave it a couple coats of fabric waterproofing spray, and now I can simply hose it off to get it clean! You can purchase this mat HERE! - Put down a piece of duct tape on the ground. - Keep a piece of sidewalk chalk in your kit to mark the ground when working on pavement. However you mark your spot, it really helps to be able to tell the kids, "please wait behind the line!" or "Put your feet on the clown's feet if you want to be next!" Defining your own space is just as important as defining the line. Make it clear where kids aren't supposed to go, but make sure you leave plenty of room for them to get around where they ARE supposed to be. I bought 32 feet of plastic chain on Amazon. I also have a big string of triangle pennants that works as well. In the photos below I attached the chain to my signage because we were on concrete. However, if I am in the grass, I have some pig tail posts and they are great for roping off an area! You'd never know from this picture that there is a line at least 20 kids deep just off screen! The lineup you couldn't see in the last pic! Defining your space is really important for reducing your own stress level, not to mention messy spills, damage to your kit or messy fingertips of passers-by. I personally am used to being climbed on, bumped, breathed and coughed on, but keeping my space clear is good for many other reasons too. It makes each child feel extra special that they are the only ones allowed in that space for their own special time to be painted. It gives the parent a chance to exhale and know that they can see their child among the crowd, set their purse down, park their stroller and enjoy the experience too. After we started painting I actually moved the chain from the left to the right corner of the design menu, so the board was out of our walk way. This was an event I painted at just this week. It's one of my busiest annual events, and we painted probably close to 150 kids or so in just 2 hours, but we never felt crowded. Behind us are pillars (blocked by our chairs), and together with the street and curb, people don't congregate behind us. The chain not only defines the line, but also blocks off space for the kids and parents to get in the chair, get out, and leave to the left. It also prevents people from forming two lines for two painters. 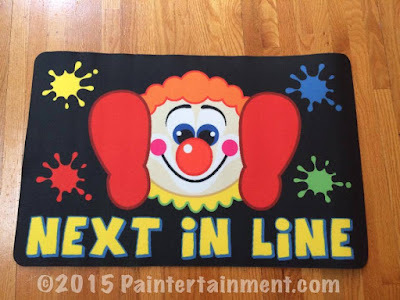 There is one spot to wait, on the mat, and whoever is available next paints that child. Panoramic view of us along the sidewalk. Define where to go when kids are DONE. Once the kids are done being painted, they need a clear exit...preferably in the opposite direction of the original line to prevent more traffic congestion. "Exit Only" tells people that the line does not form here. On the other side I had a "1 design per child" sign, so they knew when they left the chair that it would not be worth their time to get back in the line. I found this little plastic tent sign at a thrift store, which once said "slow; children at play." I spray painted the blue part, glued on a circle of magnetic-receptive vinyl, and then made interchangeable magnetic signs that I can put in that circle. So, this little sign performs several functions at any one event. The arrow can be turned in any direction as it attaches with velcro! 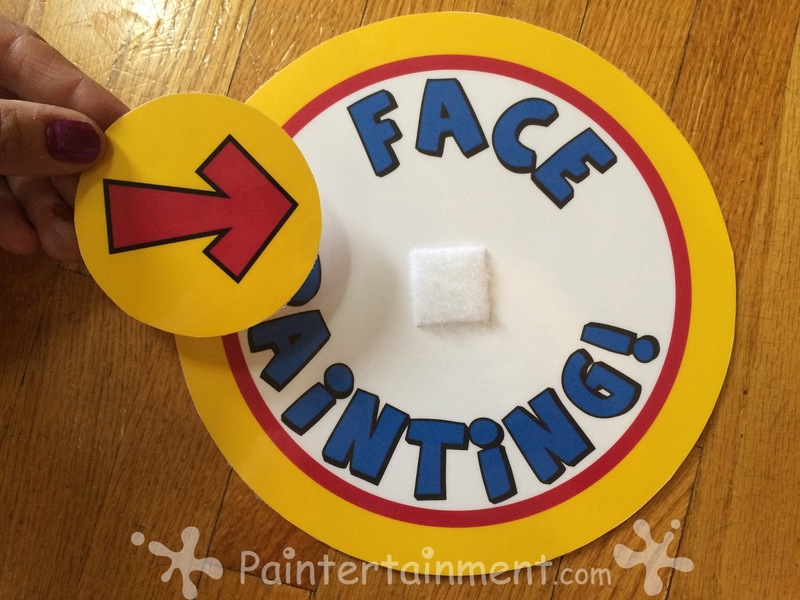 The larger circle attaches to the sign with magnets. Define the end of your shift. Ending the line is one of the toughest parts of our job as face painter. If we painted every parent who asked for "just one more," we'd never get home to our own families. We are not painting machines...we need to end at some point, and go put our own little honeys to bed. I did a whole e-newsletter on tips for cutting off the line. With this week's event it's easy because we lose all our sunlight by the end, and everyone naturally goes home! But, it is still important to give some signal that the line is ending, or at least let those still in line know that continuing to wait is futile. Magnetic signs to the rescue...I simply moved my little yellow sign to where the line forms, with a "sorry, we're closed" sign, and swap out the "line forms here" sign with another closed sign. I also have a "Open until" sign that attaches with magnets, where I can write in my end time. This lets everyone know when we are closed for business. My design menu is all attached with magnets as well. So, if needed I can remove my design menu in mere seconds, and slap up a "closed" sign in it's place. It helps close the line when kids can't see all the design options! There are many ways to end the line. I have a sash that I can have the last kid wear that says "sorry, I'm the last person to be painted today!" I also have Tyvek wristbands I can give to the last however many kids in line. Some people hand out tickets, poker chips, or stickers to the last kids in line. If you don't have a ticket, you don't get painted. When you are approaching the end of your shift, hand out as many tickets as you think you can paint in the time remaining, then put out your "closed" sign behind the line. I did this recently at an event for another artist friend of mine. She had a pouch of "tickets" (little foam shapes) and I just handed out as many as I thought I could paint in the last half hour. When the last kid with a ticket was painted, we were done. I made these little laminated tickets above for the same purpose, although the sun setting ended this gig for us so we didn't need them this time. I hope this helps you with your future HUGE events! It sure made an enormous difference for us this year at this particular event, and I now feel totally prepared for crowded events. 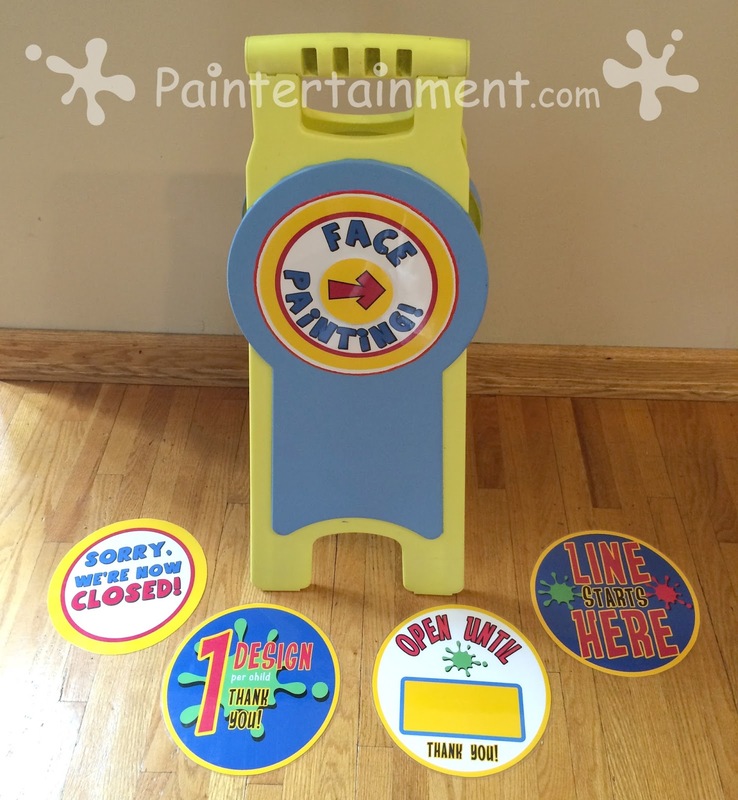 Got your own huge event coming up and need a face painting team with crowd control solutions? Hire us here!